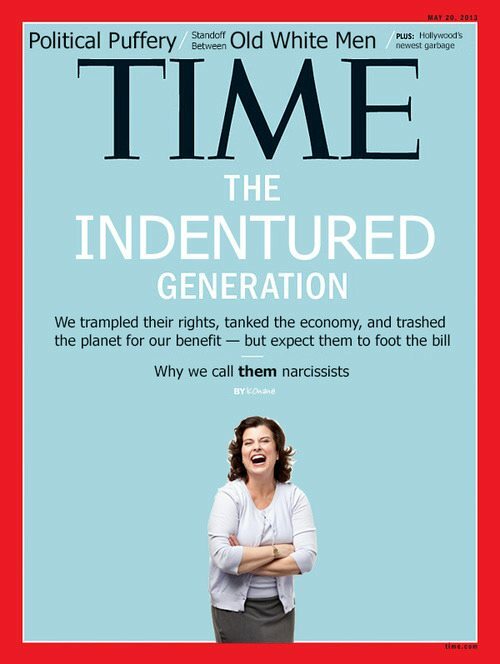 I’m sure you’ve seen the Time magazine cover “The Me Me Me Generation,” and that many responses are already circulating around the Internet (and that Time appreciates the publicity). Something like this deserves a vigorous response, because young people need to stick up for themselves. Remember that? The media talks about it incessantly, except in this case. Many entry-level positions are being replaced with internships, or being occupied by temps and people displaced from higher positions. The desperation of workers young and old also makes it easier for employers to cut full-time positions down to part-time, throwing benefits out the window in the process. I guess wanting a job instead of occasional work makes a person narcissistic. It also means recent college graduates are competing with people who will work for free (isn’t that slavery?) on the one hand, and people who out-qualify them on the other. But hey, this isn’t the Great Depression, right? Many young people are employed, so why don’t they move the hell out of their parents’ basements? 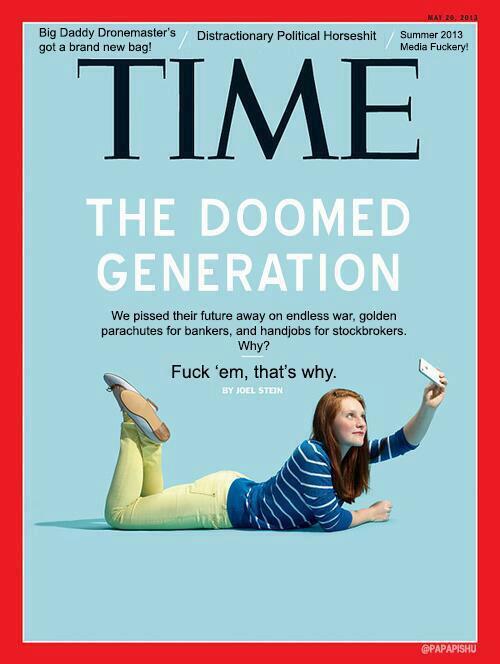 Well, unlike the people who get to write Time cover stories, today’s youth are saddled with student loan debt. In fact, with so many people spending so much of their (theoretical) income on loan repayment, I honestly can’t see how society will function when the Baby Boomers finally retire. Some might view this as excuse-making; past generations have been worse off than this one, after all. Or have they? Growing up in New York City in the 1970s, my dad had a much harder life than me, but he did get to go to college for free. He was also allowed to feel frustrated about his job prospects without being called lazy and narcissistic. This generation isn’t the first to come of age during lean economic times, but it is the first to be ridiculed by the same generation that raised it. Our parents told us to go to college, because getting an education is important. They tell us to enjoy our youth, because once it’s gone, it’s gone. How does following their advice make us bad people? “Millennials” aren’t perfect, but they have nothing to apologize for when compared to the Baby Boomers. The Boomers drank, smoked, and partied as much as anyone and, it’s hard to describe the hippie movement and other introspective fads of the 1960s as anything but selfish. “Millennials” certainly don’t protest like them, but it’s important to remember that ‘60s anti-war and civil rights protests only involved a small minority of college students, who had a big incentive in the form of a military draft. Also, their parents thought this civil disobedience was narcissistic. Those adults were wrong, of course, and so are today’s. It;s easy to peg young people as lazy or narcissistic, because that would shift responsibility away from the people who have made their lives so challenging. Sometimes, I am genuinely embarrassed by my generation, but that doesn’t mean we deserve to be scapegoated. This entry was posted on May 15, 2013, 11:47 am and is filed under Media. You can follow any responses to this entry through RSS 2.0. You can leave a response, or trackback from your own site. To be honest, I think that every generation is ridiculed, but I can see where you are coming from. I think it’s just how society is to look down on the younger generations and pick them apart, after all they are responsible for our survival and advancement as a society. I totally agree with you about the exploitation of the work force though. The “unpaid internship” trend is exploitation, exceptions in only the most extreme circumstances. Companies are using unpaid interns so that they don’t have to hire actual employees. It’s killing us. This post was amazing, I completely agree I do think that our generation is being scapegoated*. I know of 3 major employers in london who hired interns with no interest in employing them after the internship is up regardless on the candidate, no wonder generation x is despondent its like getting blood out of a stone ! !